"Douglas Hodge is splendidly charismatic"
Oscar-winner Sam Mendes directs this spectacular musical at London's Theatre Royal Drury Lane. Adapted from Roald Dahl's magical tale, Charlie and the Chocolate Factory follows Charlie Bucket as he finds a golden ticket to visit his favourite chocolate factory. Meeting the mysterious Willy Wonka, as well as a variety of nasty children, is this golden ticket going to win Charlie a better future? 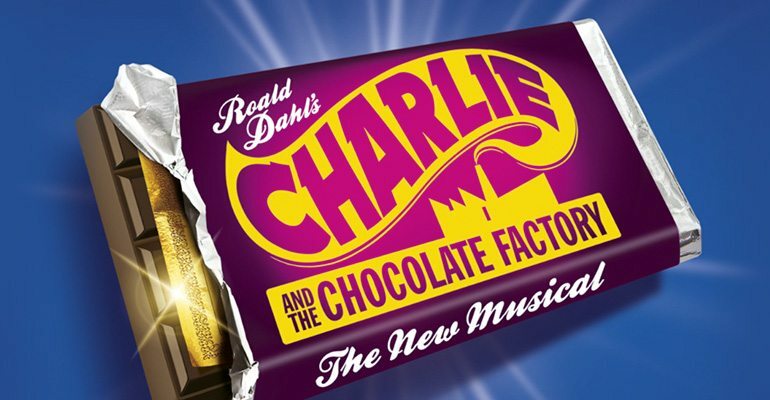 A show that must "be believed to be seen", Charlie and the Chocolate Factory features an entirely original score with songs such as "Almost Nearly Perfect", "The Double Bubble Duchess" and beloved "Pure Imagination", this musical is one of the West End's favourite treats. Make sure you grab your golden ticket, as the musical closes at the end of the year! Charlie and the Chocolate Factory is a family show suitable for children aged 5 and over. Sam Mendes. Where were you for the final show? This was a most memorable and emotional farewell. Booked these front row seats in March 2016 ... and well worth giving up the 0.05% interest on £150.00 lol. After seeing the show with my partner (and occasionally without) over 20 times we can be very judgemental ... but we wont. There was a slight change especially with Violet but we believe it could be for the Broadway transfer. And the glass elevator did not come out into the audience like it did over the years. Hm. But we will be there for the final show next week sat on the front row of the stalls again. Lets hope this dreaded cough/flu will go away by then (an epidemic if you ask me) and a nightmare for the casting director. We can not believe that the cough and flu edidemic has not hit the cast. Comments please. When entering the building was told the toilets were on the other side of the building. Why not tell people if you need the toilet go now before you go upstairs? The seating is very squashed which makes for uncomfortable viewing. Needs a revamp for todays people sizes. The building itself is smart. The show its self was good. Two of the characters have been altered which didn't fit in the show. Mike Tv jumping on the settee and Violet doing Vogue, completely out of character. Charlie however was based well with the cabbage soup dinner. Couldn't hear the singing well. The scene settings were great. Went too see the show with my family on 23rd December 2016..absolutely fantastic. A must see. Absolutely amazing. Went with family and we all loved it! Sad to hear it's ending :(! Took my family to watch the show on Saturday 29th Oct. An absolutely stunning performance by the entire cast. Great costumes / backdrops / music. Whole family loved it! WASTE OF MONEY AND TIME. I WISH I WENT TO SEE 'THE BOY IN THE STRIPED PAJAMAS INSTEAD'. Got tickets for a joint birthday treat for my wife and I. more so for my wife or so I thought. I absolutely bloody loved it, fantastic. Lovely performance. Absolutely brilliant. Willy Wonka stole the show. Will go there again! It was a wonderful show with brilliant actors and lots of lovely surprises. The audience however talked and kicked my chair the entire time. I would definitely recommend the play if it weren't for the people behind me. The singing was unclear and the performance was slow - I wanted to leave at the interval so as not to waste my entire evening. Went to see this last night. Brilliant. The cast were outstanding, especially the boy playing Charlie. Stage effects simply magical. I thought buying stall seats on Row C would be a great experience it seemed the show was fantastic but I didn't get to see much of the second half due to people sneaking from seats far back to row b. We paid the extra to sit near the front which was fine but when people don't that's very unfair and then for them to chat the whole way through and play on their phones. It was very inappropriate. They were constantly moving blocking our views so it wasn't a great second half. The ushers didn't say anything or do anything with this and the family behind with children were annoyed as they couldn't see either. its a real shame if you pay all that money and you don't get to see or hear much. Show was absolutely outstanding!!! The best musical I've ever seen. It was absolutely crammed of excitement and surprises. I could watch it over and over again and wouldn't get bored when I first went I thought it would be as good as a film but it was a thousand times better the setting is amazing but the only downside was that the seats were quite small (regarding foot space) but you don't think about that when your so tuned into the show!!! Wonderful show, great performances by both child and adult cast! This was a last minute treat for my children and we weren't disappointed - loved every minute!! The 2 guys who were working on the balcony on 27th March 2016 were unbelievable in helping my family who were not good with heights. I can only state that they were true gents and a credit to any employer. Thank you so much. I came with my daughter and my grandson, Benjy who was 7, now 8. The show was unbelievably entertaining. Where did two hours go? Benjy was so engrossed in the show, he was up and dancing! Just attended the Relaxed performance of 'Charlie and the Chocolate Factory' with a small group of young people and they LOVED it!Super special effects and lighting; high-energy performances from all the cast; entertaining and very funny....loved the Umpa-Lumpas in the various forms.It was such an inclusive experience and all the staff were so welcoming.....thank you! The show was good. I thought it was going to be better to be honest. I was slightly let down by the Oompa Loompas not being real dwarves as the costumes etc were not great and I could see the people in black behind the Oompa Loompa costumes. Other than that I enjoyed the show. Wonderful music, staging, acting throughout. My only, minor complaint was that it is difficult to understand the words in the singing at times. Veruca Salt was especially tough to hear clearly. But that's it. My entire family loved the performance. A magnificent musical!! A very moving performance throughout with amazing great acting and singing from both adults and children. It's great! Came from Canada and had a wonderful time. Seats were great in the Royal circle and I hope that you bring this production to Toronto. The show was amazing, just so disappointed with the seats....we were in boxes EE1 - EE4 box seats & they were restricted view (not advertised as such). From my seat I could see just over 1/4 of the stage....I am so upset. Wonderful show! Loved the accent of Rhys Lambert who played Charlie tonite!!! Absolutely adorable!. Shame on the other reviewers who rate the show low because they can't understand every word. It's a play! Pretty sure we know the story. Loved Mike tv's mom too! The seats are tight, kept being told we had best seats in the house (royal circle) but not sure of that. The wee Charlie Bucket had a very strong accent which was off putting at first but hey ho - he was a great little actor. Our kids (6&10) loved it, mum and dad wanted to love it but ended up just fond. Great performance. Brought back all the good memories of the original film and more. 15 of us went to see this tonight 31/3/2015. 8 of us children, we all thoroughly enjoyed the performance, Charlie being the star of the show:) he was excellent, what talent, the special effects were amazing, we were glued from start to finish and we all had a fantastic time. Would highly recommend for any age superb night out. Absolutely brilliant. Everything you want in a West End musical! Everything from the cast to the amazing set designs all come together to create such an beautiful piece of theatre, will definitely be coming back again! Wonderful show! Treated ourselves to a box as it was very affordable on a Midweek night and we needed a bit of a lift after a difficult few weeks. He couldn't have known it but Willy Wonka made our 9 and 10-year olds' year when he suddenly appeared in our box to take his bow at the end - they were grinning for hours afterwards! Brilliant performances from all the cast, including the children, who captured all their characters really well. Just one slight criticism - Veruca and Mike were a little bit shouty and might slow down their delivery a bit, as it was hard to catch some of what they were saying/singing. But they were still great and the show is technically fantastic - great sets, excellent effects (especially the final bit of stage 'magic'), and fun songs. Well worth it. Wonderful and beautiful. Funny and magical. We all loved every minute. Didn't want it to end. Thought most of the cast were brilliant. Visually was great. Charlie is clearly a very talented lad, but such a strong Scottish (sounded Glaswegian) accent was difficult to understand and was a bit out of place with the rest of his family's accents?? Very surprising casting & off putting. I found the show to be lovely, fun and very lively, but the whole show was ruined by people coming in late and being shown to their seats! Not only is this disrespectful to the actors who have spent so long rehearsing for the show, but also to the paying customers who want to enjoy the show. Basic theatre etiquette. Therefore i will not be going back here. Totally amazing.Sat in A1 - 3.Great seats with lots of leg room.No heads in front of us and great view of stage.Original spin on story.Would definitely recommend.All adults in party.Thank you for a very enjoyable show.Well done. Very good show but spoilt by the inconsiderate staff that left me sitting right next to a pile of sick (lady next to me was not very well)!!! They moved people in front and to one side of her but when I questioned why I had to stay seated there reply was well there is only another 20 mins of the show left!! Bearing in mind I had missed most off second half due to the incident. Not very impressed with the way the whole thing was handled after having payed a lot if money for the tickets. Great show, would recommend it. Although I feel your "chocolate chocolate, get your chocolate it'll give you diabetes" comment was highly inappropriate. So glad I hadn't brought my type 1 diabetic daughter!!! Felt the singing was lack luster from 'WW', as for the children, other then 'Charlie' couldn't understand half of what had been said. Sound quality overall was poor as the orchestra was louder then the children. If you go expecting original story be prepared for disappointment, sorry. I enjoy theatre but this felt like it was just there to make money not entertainment. Jennings Wonka came across overly camp, and a poor singing voice, Very disappointed with Charlie , very stagy and shouty, he had a open mouthed sort of a grin which was very off putting. And we couldn't always understand what he was saying. Not a patch on the previous Charlie we saw.The rest of the child cast did a good job, if sometimes too loud to understand, Diction definitely an issue. Oompa Loompas were brilliant however, The show has some lovely magical moments. And I personally like the new songs. The fact that lots of free upgrades were been offered says it all. The first half is average or below. The second half is much more exciting, colourful and vibrant. Lots of the songs are belted out so loudly that the words cannot be understood. Not up to London theatre standards in my opinion. My families first visit to a London Show. My 6 year old and 8 year old were enthralled by the first half of the show. They were distraught at its cancellation after the interval. Cancellation handled poorly and no one available to advise if tickets available for the following nights performance. As not from London will probably never see the end of this show. Most disappointing night out I have ever had. Really badly handled cancellation of the show on Friday night - understand that tech issues happen but the guy on the stage saying come back isn't helpful when so many travelled from miles to see the show at great expense! Better to say 'refund available' let's hope! Poor service delivery - of what is suppose to be a great show - well half of it was!!! Never saw the next bit or will!! Took my nieces during kids week, I personally found Wonka and Charlie's performance weak, and sometimes hard to make out what the child performers said. Saw previous cast over Easter with Douglas Hodge and a northern child playing Charlie, which were much better. Having said that the Oompa loompas were a hit with the girls, songs great and effects well worth a visit. Overall if I hadn't have seen it before would have probably given it 4 stars. An out of this world performance. A wonderful cast portrayed Dahl's wacky characters perfectly. My 7 year old boy is beyond ecstatic to have been 'shot' by Mike Teavee, the absolute highlight of his summer holidays. First show I have seen in London and I was not disappointed. Brilliant from beginning to end. Memory will stay with me for life. Amazing show, one of the best that i have seen for a long time. Couldn't hear the first act though, as the theatre admitted a 2 year child, that was seated in front of me and the mother spent most of the first 20 mins, noisily feeding it a takeaway pizza. Disappointed by the show, sets and supporting cast good but not impressed by Wonka or some of the main child cast, couldn't understand Mike and Violet too fast and shouty, and the Scottish accent of Charlie made it impossible to understand what he was saying, No Charlie warmth either. it was very odd due to the accents of the rest of the Buckets. A pity as Augustus and Verucca were very good, and we loved the Oompa Loompas. Firstly I would just like to say the showing was amazing but was spoilt for several reasons. We were seated on row yy and throughout the whole performance we were blasted by freezing cold air from large air vents on the back wall- all three of us had sores by end of performance. Also three ushers constantly walked up and down the aisle through the whole performance- 'patrolling' and kept blocking our view of the stage- we presumed someone was taking photos - could have been dealt with more professionally. Also as the saying goes' you get what you pay for' so having opted for cheaper seats we could only see half of the stage due to the balcony - rather sad for the final glass elevator scene as we couldn't see it at all. So to sum up - brilliant show but very disappointed with the theatre and it's staff. Had the most amazing time, best West End Show I have seen.The set &amp; effects spectacular.Better than the film, If your tall book aisle seats or a box or legroom seats, however, VERY cramped. Outstanding Matinee show on the current casts final day, All of the performing cast were amazing, Dougy Hodge our favourite Wonka of all time, Nigel Planer a pure comedy genius Grandpa Jo and one of our favourite Charlie's Troy Tipple totally born to the part our other favourite being super talented Jack Costello, these kids are pure Gold. This cast has given us such pleasure and always a great to see the show with them in it. A great heart felt thank you for the joy you have brought to us at the Theatre Royal. I was at the Matinee performance on Sat 12th April and have to say that our party of 7 (4 adults and 3 children aged from 5 to 69) all thoroughly enjoyed it. We had a couple of understudies and thought they couldn't have been better, I would like to know who it was who played Willy Wonka as he was amazing and I wouldn't want to watch anyone else play the part. I would be grateful if someone could let me know his name. Well done all the cast on a truly inspiring show. Wow wow wow!!!! Brilliant performance, excellent acting, lighting and props, and what a wonderful surprise we were upgraded to The Royal Circle and had brilliant seats. Lovely afternoon!! What an incredible show! For me, Verruca Salt-we saw her today 4th Jan 2014-was the star of the show! What an incredible talent!!! The show was mesmerising and brought tears to my eyes at times it was so good. Just me and my 8 year old daughter went and I'd reccomend this show to everyone! I feel privileged to have seen it and would love to again. Fantastic. Fantastic from start to finish. A magical adjunct to a Christmas trip to London. Vuruca Salt was outstanding. We loved her! The new songs are amazing! Almost nearly perfect, loved it. The theatre that I am a part of is doing willy wonka and I'm auditioning tonight - I wish there was a way the could do this new terrific version! We went to see the show monday night and we had a fantastic time.Great cast and a really great show. Best show I have seen in a long time. Better than matilda which was brilliant. The set is fantastic it is purely magical. The cast are wonderful. Thanks for a brilliant time. I seen this show while visiting London in June, it was amazing. Something that should be brought to Australia. We took our 2 children (8 yrs and 10 yrs) last night!!! Fantastic show. Makes you feel like a child again and you can't stop smiling! Special effect fabulous and as you think you've seen the best bit, the next bit is even better. So clever! A must watch, a great night out for all ages. Well done! What a fantastic show. I just got back from taking my two children (9 and 7) who fell in love with it. I've never seen them sit through something with their mouths open! Entertaining for children AND adults. I really enjoyed this show, but saw it in previews and I think it can still get even better. The new songs didn't sit too well on first listen, and I preferred hearing 'Pure Imagination' from the film. WOW! This production is unlike anything I have ever seen before. What a visual treat. Just as you think it can't get bigger and better, the next scene proves you wrong. The effects are spot on throughout and the huge stage is full of exciting things to look at. Some great performances, and it is excellent to see such a good story onstage. Saw the musical last night 23/5/13 jaw droppingly good. Kept us enthralled from beginning to end. Acting, singing, dancing, music, sets, lighting, effects all totally amazing. A Must See.